Assume for a minute that the worst has happened: Norton AntiVirus finds something it really believes is a virus but doesn’t seem to be able to act upon the file to repair, quarantine, or delete it. If this happens, one of two things is true: The file is a virus, or it’s not. Computer repair woodland hills, data recovery, computer server installation, virus removal. Not all files can be repaired, because not all the files Norton AntiVirus suspects are actually viruses. Adware (a program usually transferred to your system to push pop-ups and other ads to you based on the places you go) is a great example of this. Its only purpose is to try to track your Internet usage and feed you ads. Look at Figure 1 and you see a Scan: Summary where seven non-viral (usually adware) viruses were found, but none of them has been acted on. To view these items, click as directed in the window (or click More Details — it does the same thing). This opens an info window about these non-viral threats, as shown in Figure 2. Look at the Status column, and you’ll see they’re all listed as “At risk,” which is the Norton AntiVirus way of telling you it hasn’t done anything with them except to point them out to you. Figure 1: Scan: Summary shows non-viral threats. Figure 2: Adware files are marked but not removed. You can try to delete the file yourself using one of the Windows file management tools like My Computer or Windows Explorer. But what if it’s a file you really need? Some of the files that can be infected may be needed by Windows to run. Deleting the wrong thing could send Windows into a tizzy and make it unable to load. The first thing you want to do is to run LiveUpdate to see if there are updates available that may be able to repair the file. View Status: Opens the Norton AntiVirus Status window, which gives you an at-a-glance summary of what’s enabled and when your last scan was run. View Quarantine: Displays the list of suspicious files identified and isolated on your PC by Norton AntiVirus. View Activity Log: Shows you a summary of the Norton AntiVirus threats identified and the actions taken. View Virus Encyclopedia: Allows you to look up a particular virus name and what it does. Launch Scan Menu: Brings up your list of scans so you can run them. Consider this example: Figure 3 shows Norton AntiVirus pausing in a scan to tell you that, while running Repair Wizard, it located two files that it can’t fix. You probably want to follow Norton AntiVirus’s advice and quarantine these files, but you want to get a better idea of what exactly they are. Click one of the blue hyperlinked names under Threat Name. 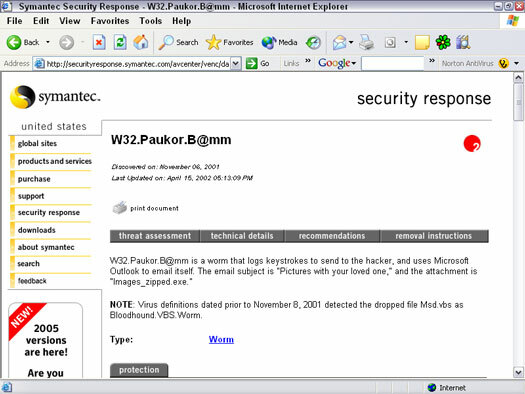 If you’re connected to the Internet, that click launches your Web browser and opens the Symantec Security Response site. You can then read through the details currently available about the file Norton AntiVirus discovered, as shown in Figure 4, which shows the details for another nasty program, Netsky. This one turns out to be a pesky little worm, which, if left on your system, could start sending itself out to people in your e-mail address book. Look back at the Norton AntiVirus window you saw in Figure 3 and click Quarantine. Computer repair woodland hills, data recovery, computer server installation, virus removal. Figure 3: The Repair Wizard reports problems.